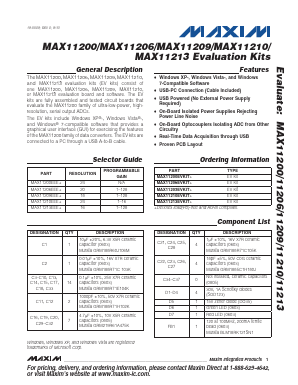 The MAX11200, MAX11206, MAX11209, MAX11210, and MAX11213 evaluation kits (EV kits) consist of one MAX11200, MAX11206, MAX11209, MAX11210, or MAX11213 evaluation board and software. The EV kits are fully assembled and tested circuit boards that evaluate the MAX11200 family of ultra-low-power, high resolution, serial output ADCs. The EV kits include Windows XPM-, Windows VistaM-, and WindowsM 7-compatible software that provides a graphical user interface (GUI) for exercising the features of the MAX11200 family of data converters. The EV kits are connected to a PC through a USB A-to-B cable.